Ena Best lived on the westerly side of Rusholme in Dorset Avenue with her parents John and Margaret. They were married in 1911 and Ena was born January 13th 1913. In 1928 when Ena was 15 her father who worked on the railways entered her photograph into the annual competition for the Railway Queen. The Railway Queen was selected from photographs of railway employees' daughters that had been submitted from all over the country. 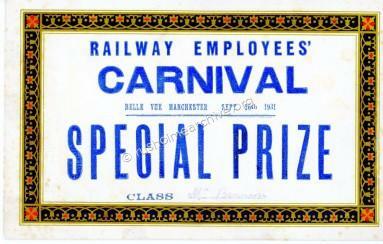 The entrants, between 14 and 16, on September 1st in the age of candidature were chosen at the Railwayman’s Carnival which was held annually at Belle Vue, Manchester. The Carnival was started in Sept 1925 to celebrate the centenary of the Railways. Organised by a committee of north-western railwaymen it became a major national event, 30 or more special trains arriving and altogether as many as 50-70,000 visitors. This was the only day of the year that Belle Vue was closed to the public, there were many different events staged to amuse the visitors; in 1926 a tug-of-war between railwaymen and an elephant was advertised! The crowning ceremony for Ena was presided over by Sir Felix Pole, (General Manager of the Great Western Railway) and Jack Bromley MP, (who was also the General Secretary of Aslef, the train driver’s trade union). 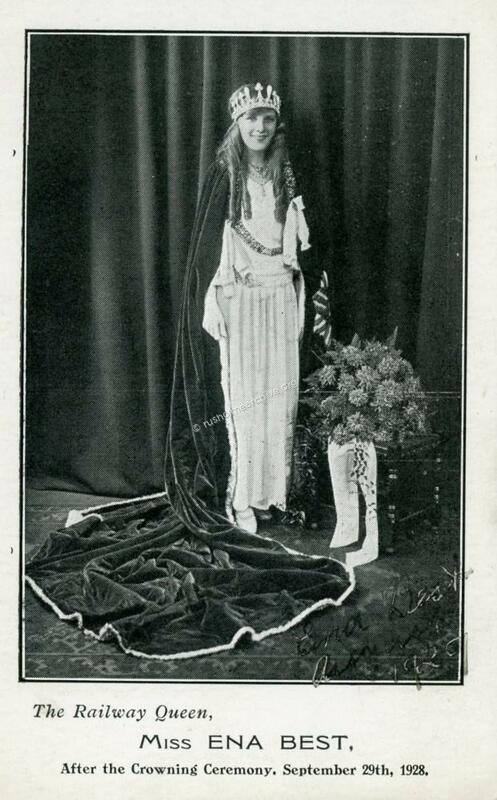 This particular carnival was filmed by British Pathe news and the crowning ceremony of Ena Best, (silent, no sound track), can still be viewed! 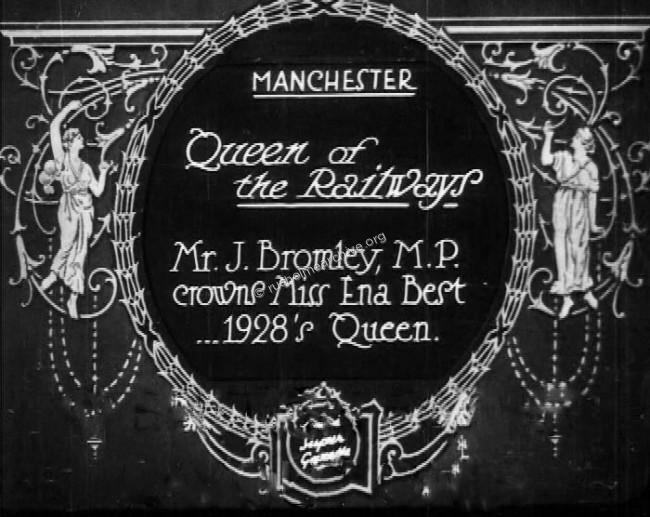 To view the crowning ceremony at the 1928 Belle Vue Railwaymans Carnival follow the link below and click on the arrow to start the film. To return to rusholmearchive.org click on the back-button of your browser. During the 12 months that Ena served as the Railway Queen a number of reports in the press referred to the duties that she undertook. For the young fifteen year old it must have been a very eventful time; Ena travelled to Holland representing the British railway workers on a goodwill visit to meet Dutch railwaymen; she spent a day at the Crewe railway engine construction works seeing how the steam engines were built, (she apparently commented to the press that it would have been a useful trip for school boys to do) and perhaps most importantly at the time she opened the longest railway platform in Europe. This platform connected the Manchester Exchange station to the Victoria station & thus created Europe's longest platform at 2,238 feet (682 m), it could accommodate three trains at once. ‘Was a mere slip of a girl with her plaits of hair falling down over shoulders’. ‘The new platform was an indication of the consistent progress of railway transport, but there was another matter equally important – the relationship between men and the employers. One of her objects she said was to foster this spirit and she though the seed was growing. There was also the matter of international peace - I have often thought that it ought to be possible for the intelligent people of the world to settle their disputes without calling upon the boys of the world to shoot each other. I have been told that I am too young to understand such things. But I do understand what it means when the ambitions of many good people are destroyed by the declaration of war. I understand it the ruined homes and wrecked lives. These are the aftermaths of war which ordinary people have to face’. The last reference to Ena Best in the Manchester Guardian was September 1929 when it reported that Ena would be attending a service at Manchester Cathedral with her successor, Molly Brown of Preston. The Railway Carnival apparently continued until 1970 and after that I presume there were no more railway queens. Several thoughts are now in my head – I wonder what became of Ena Best? Are there still any members of her family alive in or near Rusholme? The chain of Office that each successor Queen wore had a new link added for each country that the Railway Queen visited – I wonder what has become of that chain and how much longer it became as more links were added? I have now been told by Bob Watton that the last Railway Queen competition was in 1975, when Miss Brenda Tomlinson of Bournemouth was crowned at Shildon. As Brenda and Bob are married they have an ongoing interest in the chain of office and have now located it. Bob emailed me to say, "I can confirm that the Railway Queen gold chain worn last in 1975 by Brenda Tomlinson is safe & on display at the National Railway Museum in York. Warehouse no. 1990 7590 P12 refers. Best regards Bob Watton"
One Railway Queen who particularly made the headlines in 1935 was Audrey Mossum of Blackpool who visited Russia and met Joseph Stalin – she also switched on the illuminations in Blackpool! To read more about the Railway Carnival you can follow the link below to manchesterhistory.net – a marvellous website encompassing many aspects of Mancunian history. There is a detailed history of Bellevue and one page devoted to the 1949 Railwaymen’s Carnival and the crowning of the Railway Queen. For the Chethams Library follow the link below. 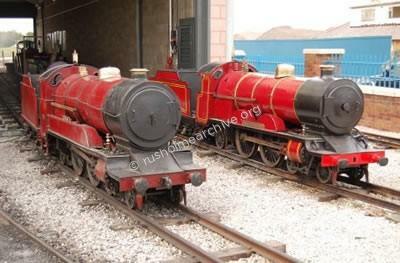 Finally perhaps the only link that remains with the history of the Railway Queen is at Rhyl in Wales. The Rhyl Miniature Railway Trust acquired a railway engine called the Railway Queen from Bellevue in the 1980’s that from 1928 had been working on the Belle Vue Miniature Railway line. I very much appreciate permission being given by Rhyl Miniature Railway Trust to display the photograph below, the Railway Queen engine is on the left. Read about the Railway Queen engine at Rhyl.